The entire ELT industry is restlessly awaiting the start of IATEFL 2019! One of the highlights of the year, the event will see over 3,000 ELT professionals come together from over 100 countries. Held in Liverpool from 2nd-5th April, it’s a chance to experience the ELT ecosystem in all its glory. In the run up to the conference, we’d like to let you know about the sessions that we’ll be running or involved in throughout the week. We’ll be talking about a range of topics including learner experience design, the pros and cons of technology-led learning, what fitness apps can teach us about motivation and applying the principles of Agile software development to course writing. Here’s where you can find us on the programme! One of the main challenges that ELT professionals face is how to deeply understand learners in order to help them and improve their learning experience. At this workshop, we will introduce the Learner Experience Design Sprint, a practical, learner-centred approach to product design that we developed at ELTjam. 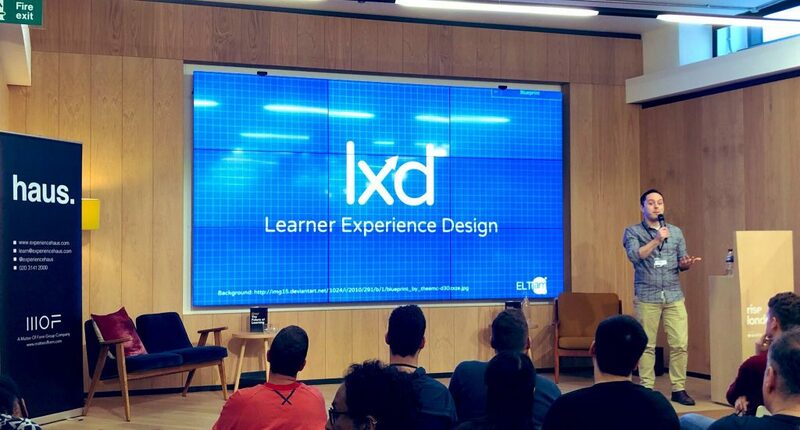 LXD responds to the need for learner experiences that are both user-friendly and provide pedagogic value. It helps to deliver learning experiences that users enjoy and that improve the overall effectiveness of their learning. Based on this mindset, we’ve created a process that puts learners at the centre of all decisions and can be implemented in learning experiences both digitally and in person. The LXD Sprint is a powerful four-step process that reframes learner problems into solutions through four key steps: 1. Understand the problem, 2. Sketch a solution 3. Prototype and 4. Validate. In this workshop, you will put into action the key steps of the LXD sprint in an ELT context and you will take away the tools to apply these to your own ideas. Get ready for a hands-on session packed with design-thinking tools and takeaways! This year, the topic of the Pearson Gallery Walk debate is: Do we still need classrooms? Katy has been invited to join a panel of experts to discuss the pros and cons of technology-led learning as opposed to instructor-led, classroom-based learning. They will talk about the present and the future of language learning, from the traditional classroom setting to the latest mobile applications and other new ways of learning a language. Everyone’s welcome, so come and join the conversation! If you’ve ever used an app to lose weight or quit smoking, you’ll know that these services help you succeed by modifying your behaviour to attain your goals. But how do they do it? In this session, we will take a look at Behaviour Change Techniques (BCTs) that fitness apps use and explore how they might be harnessed to motivate language learners. We will explore how setting clear intentions, creating a link between behaviour and a particular outcome and self-monitoring can work as particularly effective BCTs. We will see examples of BCTs from a cross-domain, internationally recognised taxonomy and explore how these might be used to help learners (and the products we develop for them) reconcile long term goals with the realities of short term effort. In 2013, we wrote a blog post outlining how the principles of Agile software development might be used to transform ELT course development. Now, we’ve finally had the chance to put this into practice on the development of a major new digital course. But did it actually work? Given the proven success of Agile in software development, it’s interesting that it is almost completely untried in many other fields – including ELT publishing and content development. At a time when publishers are struggling to remain competitive in the face of increasing competition from online products and services, the promise of a new approach like this ought to be irresistible. At the end of last year, we were given the opportunity to run a large-scale ELT digital course development project following an Agile approach. This talk lifts the lid on how it went – what worked, what failed, what we learned in the process, and what that means for where we should go next as an industry. Are you going to IATEFL 2019? Get your tickets now if you haven’t already and come say hi to us! You can also see the ELTjam team in action at InnovateELT 2019 where Jo and Amit Patel from Experience Haus will be giving a half-day workshop on user experience design essentials for ELT.